This is a guide to set up the video module in your job adverts. 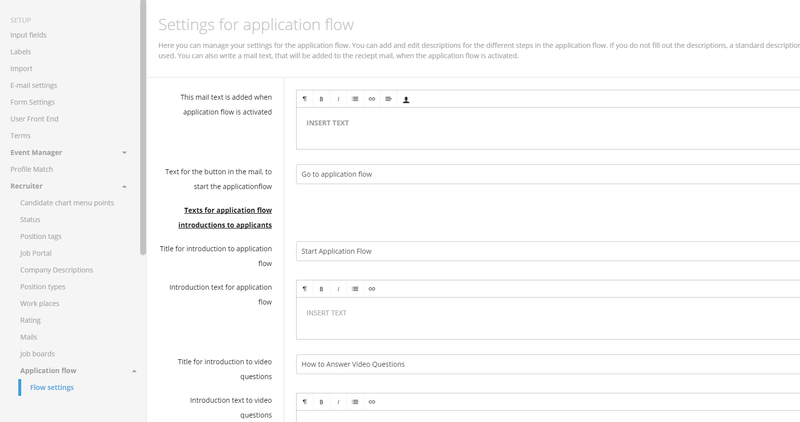 The guide takes you through the creation of video settings to video questions in the recruiter settings. Furthermore, the guide will explain how to set up video questions in job adverts. Finally, you'll learn how to find videos via the candidate card. When selecting video questions as part of your job advert, there are a number of settings to fill out. This is done so you do not have to enter all this information every time you create a new job advert where video questions are a part of it. You can find video settings in the organisation settings under the 'recruiter'-tab. Next, you locate the 'video settings' in the row of recruiter settings. When the applicant has sent an application, they'll receive an email receipt. When video questions are activated, there will be an addition to the regular email receipt. 'Email text to video questions' is placed below the line in the email (see the following screenshots). 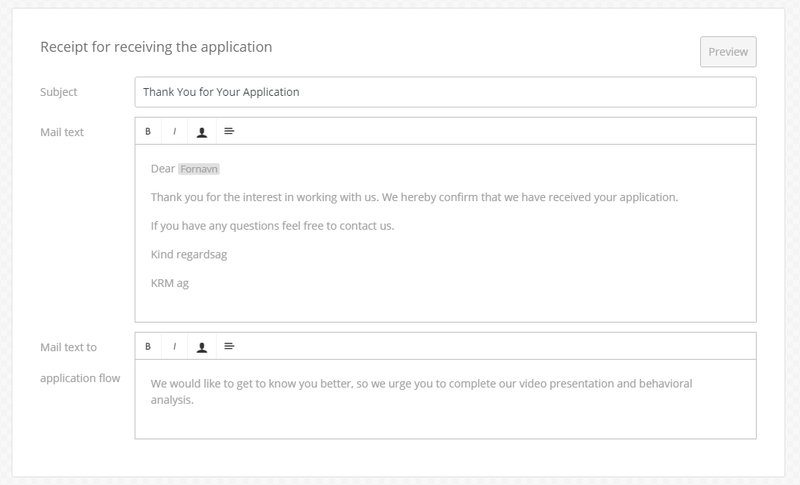 When the applicant has clicked 'go to video questions' (see the above screenshot), he is redirected to the page that introduces him to the last part of the application process. In video settings, you can set the headline for the video email and write a short text in the field called 'Guide to record video'. Here, you can choose which page the applicant should be redirected to when the video questions have been answered and sent to you. Simply insert the URL the applicant should be redirected to. In order to find video questions, go to organisation settings and then go to the 'recruiter'-tab. This is where you can create questions for the applicant. 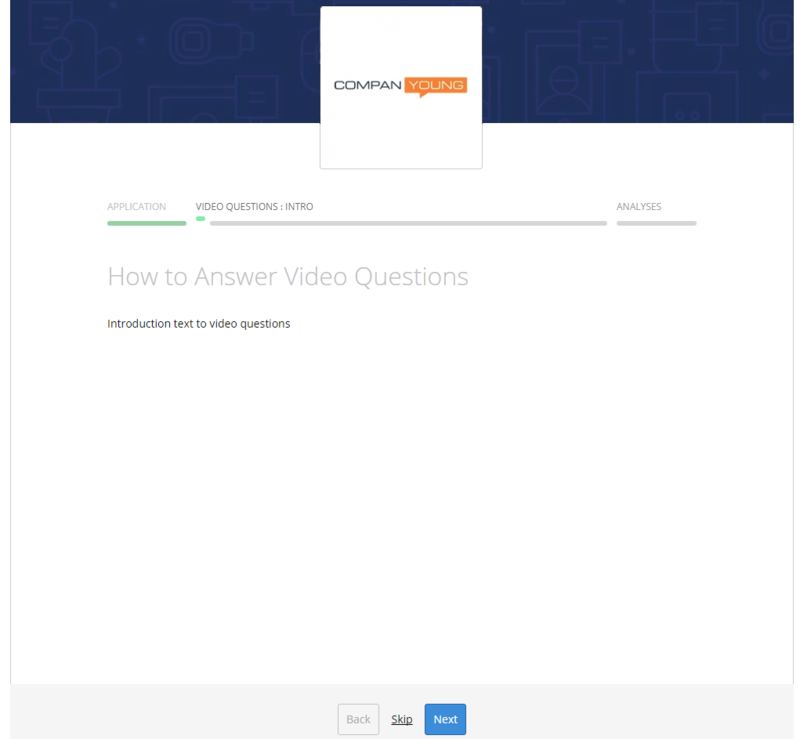 Simply click the green button 'Add video question' after which a textbox will appear on your screen. Give your question a headline - In the example below, the question is the following: "Are you comfortable working with deadlines?". In the second part of the textbox, you can describe how you would like the question to be answered. For instance: "Are you comfortable working with deadlines, or does the added pressure make you feel uncomfortable?". Finally, you can set the time the applicant has to answer the question. 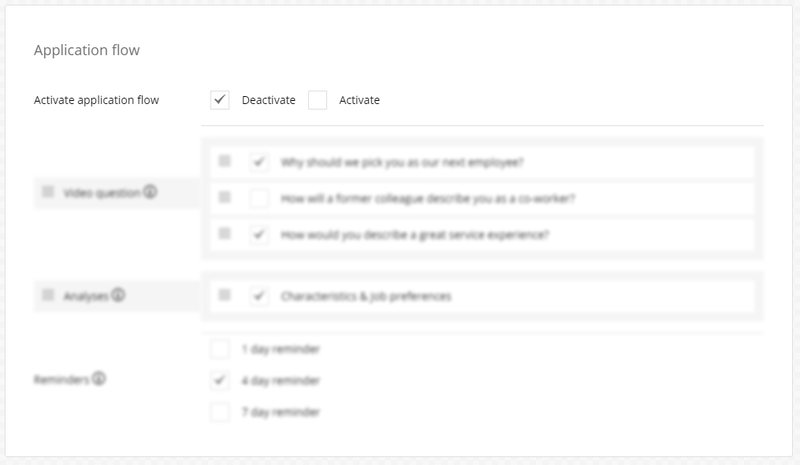 By clicking 'Actions' for each question, you can edit or delete a question. 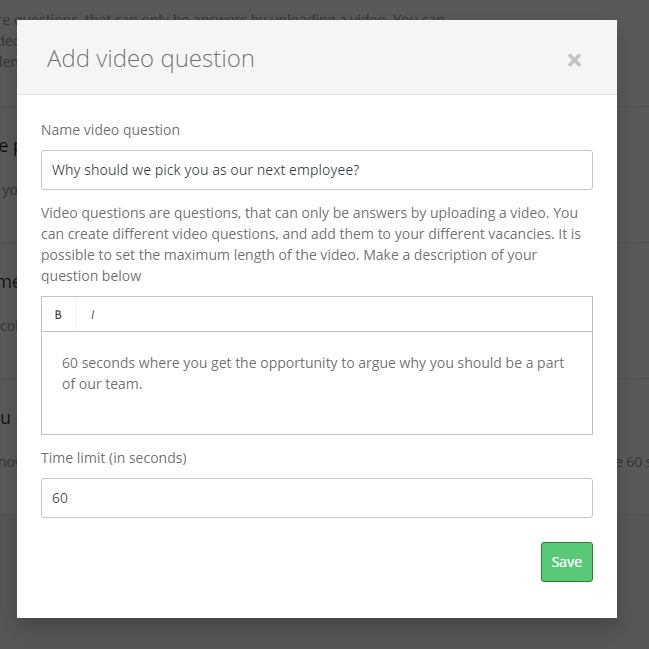 When creating a job advert, you can choose if video questions should be a part of the application process. In the following, you can read more about the steps in the job advert relating to video questions. On the first page, when creating a new job advert, you should decide whether you want to activate video questions for the job advert you are about to create. By selecting 'Deactivate' no further actions are needed. If you select 'Activate', you have to decide which video questions should be included in the job advert. In the example above there are three questions for the applicant. You can add / remove these questions by ticking off each question. On page four in the creation of a job advert, you can see and create the receipt the applicant will receive when having sent an application. If you have already filled out your standard settings under organisation settings, no further action is required. However, if you have not done that, you can do it here. In this step, you can use the function 'preview' to see what the email looks like. 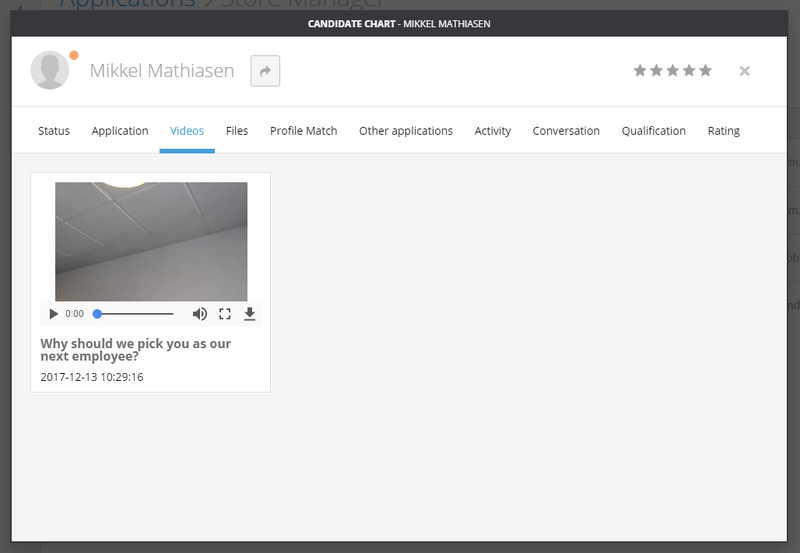 When visiting the candidate card under the tab 'Manage', you can watch the videos the individual applicant has uploaded. Select a candidate from the list, go to the tab 'Videos' and an overview of videos uploaded is shown. Here, you can play, pause, turn up the volume and watch the video in full screen-mode.